All Souls Day is marked in the Gregorian calendar on the 2nd day of November, but it is observed by Filipinos on the 1st day of the month, which is actually All Saints Day. This is explained by a UP professor of Filipino language and culture as an indigenization of a Western tradition, in this case a religious event brought about by the conversion of the archipelago into a Catholic nation. In fact, most religious traditions in the country have all been indigenized to blown-up proportions. I'm sure nobody in Spain, our old-world colonizer (for want of a more euphemistic and politically correct term, but then again, why should we sugar-coat history? ), celebrates Christmas as long as we do, or takes to heart the passion and sacrifice of Holy Week like we do. Same with All Souls Day. Along with Christmas, Holy Week and the town fiestas, it is an event kept sacred by observance, and prepared for by all, including the authorities and those responsible for keeping traffic, to and from cemeteries and to and from the provinces, moving and flowing. But All Souls Day is observed on All Saints Day because, according to my professor friend, of the traditional, pre-colonial veneration of the dead, most especially loved ones. With the concept of the intercession of saints introduced by the Catholic belief, all our dead became one with all the saints who could intercede on our behalf. It is believed that dead loved ones are the most powerful intercessors for the prayers of their living relatives. And we don't usually observe All Saints Day as an event anyway, since we celebrate each saint according to his or her feast day in the Gregorian calendar during town and city fiestas, which are marked in the calendar according to the feast day of their respective patron saints. Needless to say, Halloween is a strange concept, since it is usually associated with the monstrous dead, although with globalization and efforts to sell merchandise, it has become a reason for a party. All Souls Day, re-christened Undas in the last few years or so in Metro Manila, is a time for road trips, family reunions, and the ritual gathering of relatives at the resting places of the beloved dead, for whom candles of all colors, sizes, shapes, styles and design are lighted. It used to be a noisy, merry-making event, with loud music, guitar-playing and singing, eating and drinking in the cemeteries, but now all these are prohibited, making it a quiet and orderly, albeit very tame and colorless, affair. 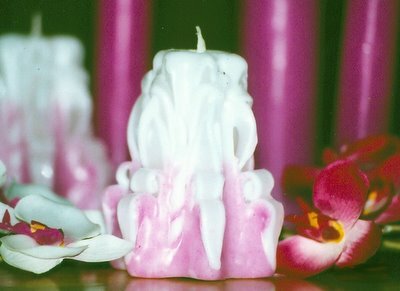 On the evening of November 1, candles are lighted along the road and outside the house gates to guide and light the path of the beloved departed. The family gathers for dinner, but no special fare is prepared. There is no special food for Undas that I know of, except traditional food prepared for out-of-towners and food prepared for company. A small serving of what was had for dinner is offered at the altar, for the dead, but people tell me that this also is an adopted foreign practice, this time from the Chinese. One food I associate with Undas, though, is inlubi, which is a rice cake made from cooking deremen in gata or coconut cream. Deremen is harvested at the same time as regular palay, so it is available only towards the end of October and during the month of November. Deremen is somewhat similar to Pampanga's duman which Karen wrote about and whose festival is celebrated on the 1st Saturday of December. The processes of making deremen and duman are almost the same, with the Pangasinan deremen made distinct by the use of bamboo for burning and not a clay pot like in Pampanga. Deremen is made by harvesting malanguer a pagey (young palay of the sticky rice variety) specifically planted for deremen, and put in narrow bamboo tubes of the bolô variety, for which the Pangasinan province was formerly named (Cabolòan, meaning a place of bamboos). The bamboo is burned from one end, letting the palay fall as the bamboo burns and consumes itself. The now burned palay is then pounded by a heavy wooden bayò (pestle) in a large stone lasong (mortar) until the husks are removed. 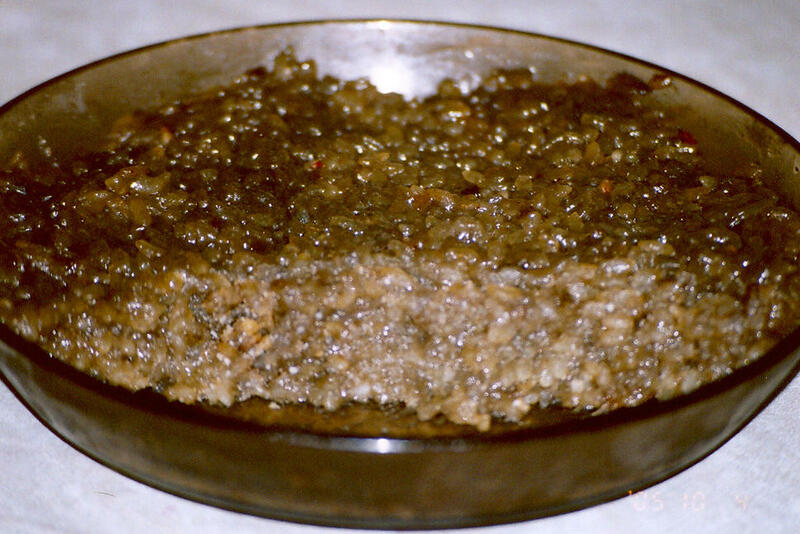 The resulting belas (rice) is a soft, almost flat and blackened deremen that smells and tastes green and smoky. It is sold by a measure of a can of condensed milk, of which about a dozen is needed to make a bigaô (bilao, a round, woven bamboo winnowing tray, pictured above) of inlubi. Inlubi is a term that can be interpreted as roped, or woven, pertaining to the cooking process. Deremen is stirred, turned and folded in gata, like weaving or braiding it. It is sweetened with sugar, made fragrant by anise, and some cook in malanguer (young coconut slices). 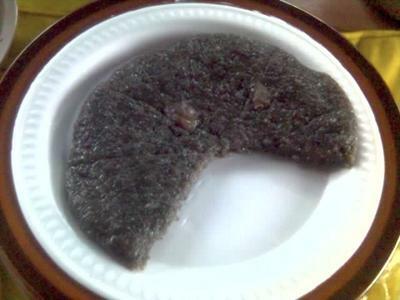 It is a kanen (rice cake) with a distinct smoky sweet taste, with the aroma of rice fields being burned for the fallow season. Sadly, the quality of deremen has deteriorated over the years. With the construction of a mill exclusively for de-husking deremen, the palay no longer goes through the painstaking process of manual pounding. 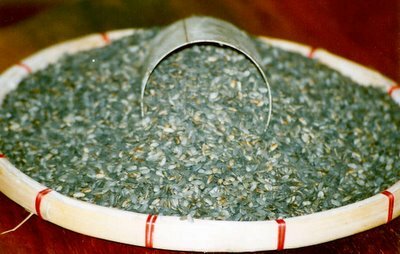 The milling strips the deremen of its unique flavor, and turns the palay pale. Farmers compensate for this by soaking the deremen in black food coloring, which brings back the color, alright, but not the characteristic flavor. Vendors have also taken to soaking the deremen in water to double the volume and so rake in more profit, but this deremen becomes rock hard when cooked and will not keep. So real, good quality deremen and inlubi is hard to come by nowadays. It can still be found, but very rarely. So even as traditions continue to be kept and observed, the things associated with them decline and change, and maybe get replaced by others more modern. The beloved departed must be turning in their grave. very interesting :) Doubt I can find that type of rice here tho. No, I don't think so, Mellie. Production is very limited, it disappears from the markets by December. And deremen is known mostly in and around the province only. I think I tried this food before, Kai. My grandpa is from San Fabian, Pangasinan. You should prepare this when we see each other in December..great idea? Yes Ting, great! I'll stock up on deremen! Very good, interesting and educational post, Kai! :) Like the duman, I only learned abt this deremen and inlubi through your blog (and the former thru Karen's). I would hazard a guess the word 'inlubi' would be equivalent to the Tagalog 'nilubid' - literally to rope or to braid. What a wonderful and informative post as usual, Kai! I remember having this at my grandparents' in Pangasinan also. Although sadly, as you said, I heard dudumen (in ilokano) is harder to come by nowadays. My cousin sent some to my mom not too long ago, and the quality is decidedly lesser than we remember. ei! sama ako sa deremen makers trip nyo!